Mob Psycho’s character designer and general animation superstar Yoshimichi Kameda keeps sharing our posts on the series on twitter. That makes us ridiculously happy, but let’s not abuse his kindness and talk about other series for a change. Last week I praised New Game’s understated character acting, while noting that it sadly wasn’t always accompanied by Dogakobo’s usual cartoony moments. Yuuki Watanabe – aka Aninabe – was one of the animators I brought up as a notable missing key player, since he embodies that style and so far had only been able to animate a short cut in the opening. So obviously, the show’s immediate response was making him the animation director for half an episode, while also drawing enough cuts himself to get the top billing in the list of key animators. Perhaps I should express slight disappointment more often, if that’s the kind of reward I get! Either way, his work was predictably pleasant; his confirmation on twitter wasn’t at all necessary to identify the segment of the episode he supervised, as the character motion skyrockets once he’s in charge. He’s not afraid to drop the drawing count for comedic effect however, and full body smears are still part of his repertoire. It’s relatively restrained when compared to his best animation though, likely because he arrived late to the project and didn’t have the time to go all out. But his output stands out even when rushed; his character art is a lot of fun by itself, yet his best gift to the series were all the cuts where he applied wonderful deformations to the characters as if to emulate the effects of physics in a fundamentally unrealistic way. There’s inertia when they come to stop and resistance when they start moving, which he portrays in exaggerated fashion. It’s not a particularly flashy technique, and this wasn’t the fanciest or most thorough application either, but it enhances even very simple scenes. This kind of approach mindful of physics is often linked to realistic animation, since emulating the way bodies react to motion is integral there, but it can be applied to exaggerated cuts as well. While it’s easy – and useful! – to apply labels, it’s important to be mindful that character acting doesn’t operate on a binary system; these pieces of animation aren’t just “realistic” and “cartoony”, but rather a combination of concepts from both with a predominant kind of sensibility. Rich animation only makes that all the more obvious. When looking at particular standout cuts you can still feel Aninabe’s hand behind it all. Scenes like this with his combination of plentiful motion and stylized cuteness plus his particular sense of timing make it hard to tell whether he animated them or simply corrected everything heavily. The one cut he brought up himself on twitter was Shuu Sugita’s work, since he found the drawings and rhythm rather amusing. Again not the flashiest scene, though it’s easy to see why an animator with his proclivities would be fond of cuts like that. Those of you who don’t personally care about New Game might want to keep an eye on Aninabe as well, since I get the feeling he’s going to put those skills to use on interesting upcoming works. He’s mainly linked to Dogakobo, meaning that he’s always a candidate to show up as the main animator on one of their projects – and who knows, perhaps debut as character designer/chief animation director, since the studio notoriously trusts younger staff more than most companies. Serves to say, any project where he’s involved to that degree is an immediate candidate to become a notable production. 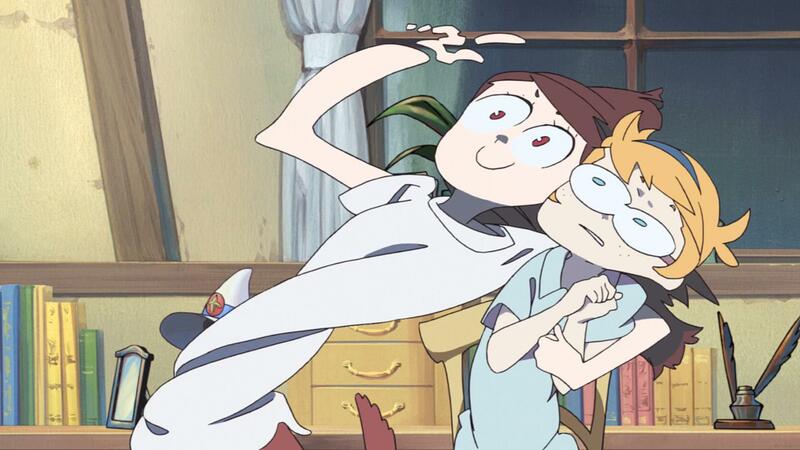 If he’s not tied to a main project over there though, I would be very surprised if he didn’t end up becoming an animation director for Little Witch Academia TV. He’s built a solid relationship with Trigger during the last few years, which lead to him becoming one of Kiznaiver’s main assets; regular key animator, plenty of animation direction duties and even layout supervision throughout the show. He also got to direct, storyboard and fully draw the ending sequence, which showed a more delicate and nuanced side of him than we were used to. It’s his comedic side that makes him an excellent target for the series however, since his sensibilities happen to align perfectly with the series’ style. The wildest Aninabe is a big fan of smear trails, afterimages of limbs, eye multiples, the kind of fun tricks that sometimes feel closer to western cartoons. 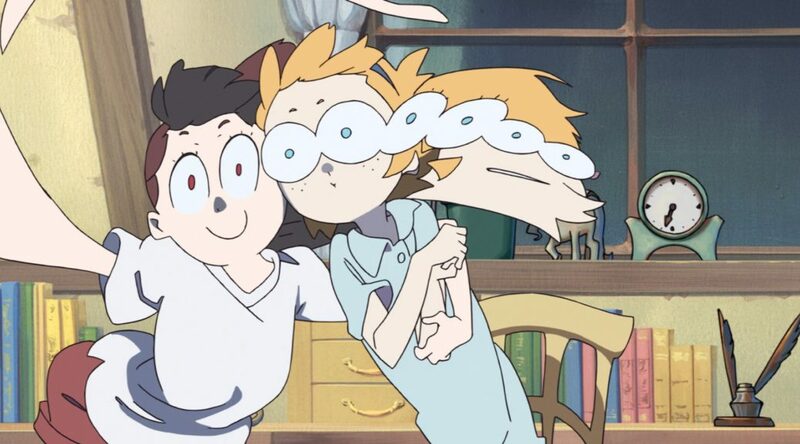 And that’s what LWA is at its core – it’s hard not to see the resemblance between his work and Akko’s loose and fun drawings. Yoshinari must be aware of this compatibility, and now that Little Witch Academia will face a much more demanding production he’ll want to have him by his side if possible. 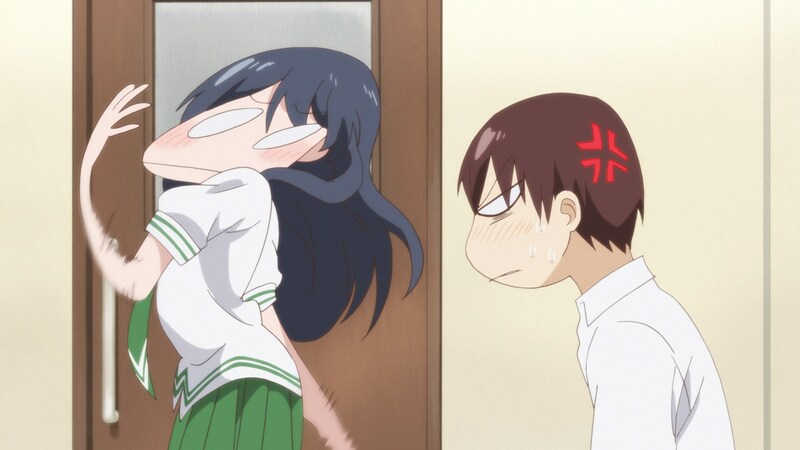 While we’re on animators with a knack for mixing rich body motion and amusing exaggeration, Ryo Araki reappeared on KonoBi. He hasn’t been as much of a regular as in his previous project at Feel, but he makes his appearances count. When it comes to his realistic cuts, Araki’s work catches the eyes because he treats bodies as a combination of elements rather than a single entity; hair, every limb, clothes and everything else move individually in a mesmerizing way. This overlapping action is made even better by the follow through – when coming to a stop all those parts don’t suddenly freeze but rather will still swing a bit. It’s not as if a body moving perfectly harmonically and in unison can’t be part of an excellent piece of character acting. However, there’s something inherently fascinating about the controlled organic chaos of his work. If the objective of character animation is the illusion of life, then very few TV anime artists are on Araki’s level. And that’s not all, of course! Much like in his work from the first episode, Araki combined that rich acting and technically outstanding work with some cute stylization. It takes a secondary role this time around and it’s not cleanly split, but he still spices up the scene with cartoony charm. So much of Araki’s current style can be traced back to his good pal Tetsuya Takeuchi, but I feel like this aspect might be where he’s already surpassed the master. It’s hard not to crack a smile at his sillier work, so I would be perfectly fine with him staying on series with a high comedic component. I had plans for more this week but ended up going overboard, especially when talking about Aninabe. At this point I don’t have to explain you that I have issues shutting up about things I love, and fun character animation is my weakness. OK, one of my weaknesses. But good news for you, since that ultimately means I already have cool things scheduled for next week! Pretty much, honestly! He’s been influenced by him so much that it’s hard to tell them apart, but he seems more into stylized cute animation than him. Cuter Takeuchi is not a bad thing to be.